The Queen of Heaven in the Kingdom of the Divine Will. Mary sets out in search of Hearts to be Sanctified. Visit to St. Elisabeth; Sanctification of John. Celestial Mama, Your poor daughter has extreme need of You. Since You are my Mother and the Mother of Jesus, I feel the right to be near You, to place myself at Your side, and to follow Your Steps in order to model mine. O please! Holy Mama, give me Your hand, and take me with You, that I may learn to behave well in the different actions of my life. Blessed daughter, how sweet is your company to Me. In seeing that you want to follow Me in order to imitate Me, I feel refreshment for the Flames of Love that devour Me. O! Yes, having you near Me, I will be able to teach you more easily how to Live of Divine Will. While you follow Me, listen to Me. As soon as I became Mother of Jesus and your Mother, My Seas of Love Doubled, and unable to contain them all, I felt the need to pour them out, and to be the first Bearer of Jesus to creatures, even at the cost of Great Sacrifices. But, what am I saying—Sacrifices? When one really Loves, Sacrifices and Pains are refreshments; they are reliefs and outpourings of the Love that one possesses. O! My daughter, if you do not experience the Good of Sacrifice, if you do not feel how it brings the Most Intimate Joys, it is a sign that the Divine Love does not fill all your soul, and therefore that the Divine Will does not Reign as Queen in you. It alone gives such Strength to the soul as to render her Invincible and Capable of bearing any pain. Place your hand upon your heart, and observe how many voids of love are in it. Reflect: that secret self-esteem, that becoming disturbed at every slightest adversity, those little attachments you feel to things and to people, that tiredness in good, that bother caused in you by what is not to your liking, are equivalent to as many voids of love in your heart; voids which, like little fevers, deprive you of the strength and of the desire to be filled with Divine Will. O! How you too will feel the Refreshing and Conquering Virtue in your sacrifices, if you fill these voids of yours with love. My daughter, give Me your hand now, and follow Me, because I will continue to give you My Lessons. So I departed from Nazareth, accompanied by Saint Joseph, facing a long journey, and crossing mountains to go visit Elisabeth in Judea, who, in her advanced age, had miraculously become a mother. I went to her, not to make her a simple visit, but because I Burned with the desire to bring her Jesus. The Fullness of Grace, of Love, of Light that I felt within Me, pushed Me to bring, to Multiply—to Increase a hundredfold the Life of My Son in creatures. Yes, My daughter, the Love of Mother which I had for all men, and for you in particular, was so Great, that I felt the Extreme Need to give My Dear Jesus to all, so that all might Possess Him and Love Him. The Right of Mother, given to Me by the Fiat, Enriched Me with such Power as to Multiply Jesus as many times as there are creatures who want to receive Him. This was the Greatest Miracle I could perform: to have Jesus ready to give to whoever desired Him. How Happy I felt. How I wish that you too, my daughter, in approaching people and in making visits, would always be the bearer of Jesus, capable of making Him known, and yearning to make Him Loved. I did not deny the Highest Mystery; rather, I humbly confirmed it. 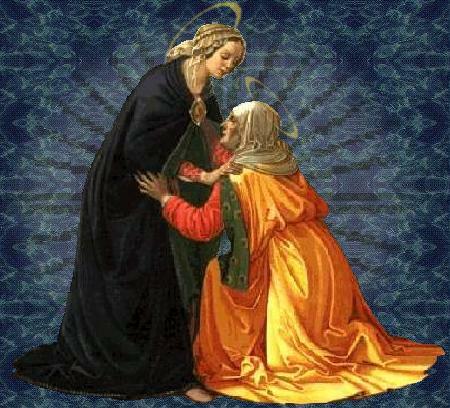 Praising God with the song of the Magnificat—Sublime Canticle, through which the Church continuously honors Me—I announced that the Lord had done Great Things in Me, His Handmaid, and that because of this, all peoples would call Me Blessed. My daughter, I felt Devoured with the Desire to pour out the Flames of Love that Consumed Me, and to reveal My Secret to Elisabeth, who also longed for the Messiah to come upon earth. A Secret is a need of the heart, which irresistibly is revealed to persons who are capable of understanding each other. Who can ever tell you how much good My Visit brought to Elisabeth, to John, and to their whole household? Each one remained Sanctified, filled with Gladness, felt unusual Joys, and comprehended things unheard-of. And John, in particular, received all the Graces that were necessary for him, to prepare himself to be the Precursor of My Son. Dearest daughter, the Divine Will does Great and unheard-of things wherever It Reigns. If I worked many Prodigies, it was because It had Its Royal Place in Me. If you let the Divine Will Reign in your soul, you too will become the bearer of Jesus to creatures—you too will feel the Irresistible Need to give Him to all. Holy Mama, how I thank You for Your Beautiful Lessons. I feel that they have such Power over me as to make me yearn continuously to Live in the Divine Will. But so that I may obtain this Grace— come, descend into my soul together with Jesus; renew for me the Visit you made to St. Elisabeth and the Prodigies You worked for her. Ah! Yes, my Mama, bring me Jesus—Sanctify me. With Jesus I will be able to do His Most Holy Will. To honor Me, you will recite the Magnificat three times, in thanksgiving for the Visit I made to St. Elisabeth. Holy Mama, Visit my soul, and prepare in it a Worthy Dwelling for the Divine Will.